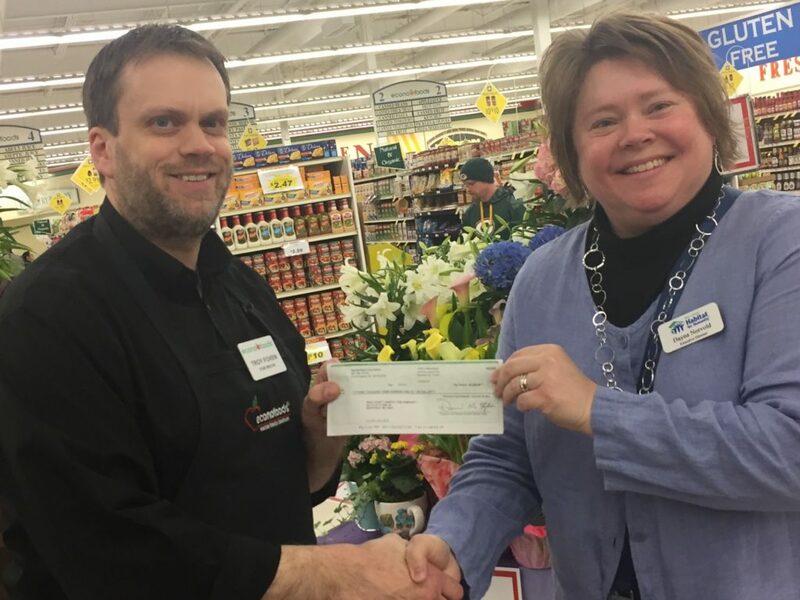 NORTHFIELD, Minn. – As a result of the Rice County Habitat for Humanity’s partnership with the SpartanNash Foundation and the Econofoods in Northfield, the local Habitat affiliate recently received a $3,300 donation. The donation – which took place on April 10 at the Econofoods located at 601 Division Street in Northfield – will help build hope and affordable housing for Habitat homebuyers. Between Feb. 8 and 19, the SpartanNash Foundation hosted a companywide retail scan campaign in SpartanNash corporate-owned stores in eight states. Store guests and company associates who visited the stores during the 12-day retail scan campaign had the opportunity to donate $1, $5 or $10, with 100 percent of dollars raised going to support 79 Habitat for Humanity affiliates such as Rice County Habitat for Humanity. Driven by the vision that everyone needs a decent place to live, Habitat for Humanity began in 1976 as a grassroots effort on a community farm in southern Georgia. The Christian housing organization has since grown to become a leading global nonprofit working in nearly 1,400 communities throughout the U.S. and in more than 70 countries. Families and individuals in need of a hand up partner with Habitat for Humanity to build or improve a place they can call home. Habitat homeowners help build their own homes alongside volunteers and pay an affordable mortgage. Through financial support – such as the donation from the SpartanNash Foundation and Econofoods – volunteering or adding a voice to support affordable housing, everyone can help families achieve the strength, stability and self-reliance they need to build better lives for themselves. In total, the SpartanNash Foundation’s retail scan campaign to provide shelter raised $202,350 on behalf of its 79 local Habitat for Humanity affiliate partners. Since 2006, the SpartanNash Foundation has raised more than $1.5 million to support local Habitat affiliates. SpartanNash – which owns the Econofoods in Northfield – underwrote the cost of the fundraising campaign so that all donations will benefit the Rice County Habitat for Humanity. The retail scan campaign to provide shelter is the first of four fundraising campaigns the SpartanNash Foundation will execute in 2017. Upcoming scans will support Special Olympics (May 3-14), patriotic partners (June 28-July 9) and community food pantries (Aug. 30-Sept. 10). For a complete list of stores that participated in the companywide scan campaign and the Habitat affiliates they partnered with, visit: spartannash.com/Habitat-for-Humanity.